CHARLOTTE, N.C. – Season-ending losses are typically filled with tears and disappointment, frustration of what could have been had a certain play or shot fallen differently. But when Lipscomb lost to North Carolina by a score of 84-66 in the first round of the NCAA basketball tournament on Friday, it didn’t bring the type of shock that usually comes in March. Yes, there were a few hung heads and some tears from the Bisons, who had hoped to pull an upset against the defending national champions. However, when the team returned to their Holiday Inn in uptown Charlotte, the lobby wasn’t filled with sadness. Seniors Aaron Korn and George Brammeier were seen hugging family members. Rob Marberry took a seat on a couch to talk with friends, sporting a bruise after taking an elbow to the face early in the game. Other players opted to get up to their rooms and pack for the team’s charter flight back to Nashville. There were no signs of a crushing defeat. How could anyone be overly upset? The Bisons won their first-ever ASUN tournament title and stood their ground in their March Madness debut. Sure, it’s cliché to say that one loss doesn’t define an otherwise successful season, or to call the team “Champions of Life,” like a certain ex-Tennessee football coach might. But for a program that had never reached the Big Dance, Friday’s game was much more of a postscript than a climax. 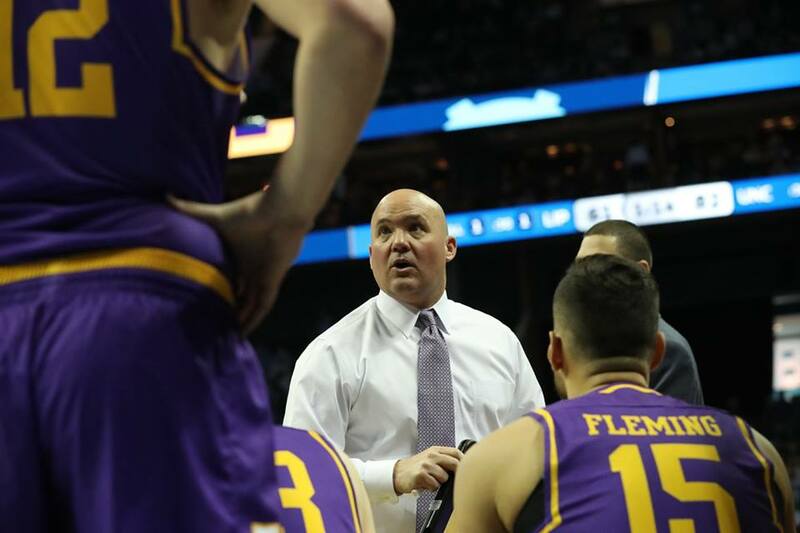 The matchup served as a multi-day celebration for Lipscomb fans, who had long awaited a tournament appearance after enduring several lean years since program transitioned to Division I play in 1999. Amidst a sea of Carolina blue, Section 113 of the Spectrum Center was filled with Purple and Gold. The crowd contained a mix of students, boosters, parents and alumni – some of whom had moved away from Nashville and hadn’t seen the team play in-person in years. Casey Alexander’s team battled, and even hung with, their legendary opponent for the better part of the first half. The Bisons led by as many as six after Cooper swished a three with 13:02 left before halftime, but the Tar Heels went on a 13-1 run in the final 3:05 to take a 43-34 lead into the break. Despite keeping North Carolina stars Joel Berry (14 points) and Luke Maye (10 points) below their season averages, the Bisons’ defense couldn’t contain the Tar Heels’ talented rotation, which also included Theo Pinson (15 points) and Kenny Williams (18 points). Lipscomb simply couldn’t keep pace with North Carolina’s clinical offense and ultimately never recovered from the poor ending to the first half. Part of that necessary magic would have been a career performance from Lipscomb star Garrison Mathews, but the Tar Heels held the ASUN first-teamer to just eight points, tying his lowest output of the season. In fairness to Mathews, the Bisons wouldn’t have been in Charlotte without his contributions throughout the season – none more important than his 33-point outburst in Lipscomb’s 108-96 victory over Florida Gulf Coast in the ASUN title game. Fortunately for the Bisons, the nucleus of this team will be back next year. That includes all five starters and senior guard Nathan Moran, a key cog who missed the entirety of the season due to hip surgery. The Lipscomb players made it clear that their goal isn’t simply to return to the Big Dance. Laugh all you want, but the Bisons want to win a tournament game next season. “We’ve been here, so now we know what it takes, and that all our work in the off-season should be for this game…and to come out with a win next time,” sophomore Michael Buckland said. But before the hype for next season begins, the Lipscomb faithful should take time to appreciate and reflect on the season that was. A 23-10 record, an ASUN title and a No. 15 seed in the NCAA tournament is nothing to sneeze at. The past few weeks of upsets and last-second shots are further proof that making it this far takes talent, great coaching and even a bit of luck. One poor shooting night can end a season’s worth of work in a few hours, a thought that Lipscomb fans should keep in mind before clamoring for a Final Four run in 2019. Nonetheless, Allen Arena will be an exciting place to be come November, and should the ball bounce their way, look for the Bisons to play in March again.